Traveling to and from William & Mary is about to become a whole lot easier, and a lot more sustainable, through a new carpooling program established by the College over the summer. The program, labeled as Sustainable Transportation, is part of a three-year effort by students, faculty and staff of the College to map out student commuting patterns and to better provide transportation services for students in a sustainable, environmentally friendly fashion. Max Cunningham ’13, who received a grant from William & Mary’s Committee on Sustainability to complete the project, worked this past summer in conjunction with faculty advisor John Swaddle, Parking Services Director Bill Horatio and Director of Auxiliary Services Carolyn Davis to research and enhance the carpooling program. A 2009 survey of College commuting patterns found that students were interested in actively carpooling, but many were still commuting to school alone each day. Members of the campus community can access the new program through a Sustainable Transportation channel on MyWM, an internal website that provides College services for faculty, staff, and students. The new channel provides links to Google Transit, a site that maps out local bus routes and safe biking routes, and a newly created “William & Mary Rideshare Service,” which helps potential carpool members find each other around campus. The rideshare service was designed in collaboration with Parking Services and AlterNet Rides, a company that specializes in designing online carpool organizational tools. Recommendations for carpooling partners are generated based on daily travel times and locations. 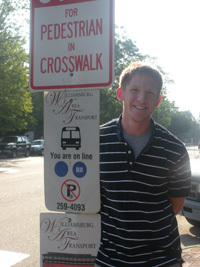 As part of his project, Cunningham also designed several web pages for the Parking Services website, which provide details of the carpooling program and the benefits of using a carpool. For example, members of a carpool are eligible to share a parking pass, thereby splitting the cost between two to three people, depending on the size of the carpool. Parking Services has also reserved 25 prime parking spaces throughout campus that can be used by carpoolers on a first-come, first-served basis. According to Swaddle, 24 carpool passes have already been purchased. Cunningham is confident the program will succeed and credits the overwhelming support from Parking Services and Auxiliary Services. According to Cunningham, the effort to bring a sustainable student commuting system to William & Mary is only just taking off. W&M students present fashion show highlighting sustainability.